EN 16242 Conservation of cultural heritage - Procedures and instruments for measuring humidity in the air and moisture exchanges between air and cultural property - This European Standard gives guidance and specifies procedures and instruments for the measurement of relative humidity (RH) in air, in outdoor or indoor environments. It indicates how RH can be directly measured or how it can be calculated from air temperature, wet-bulb temperature and dew-point temperature. 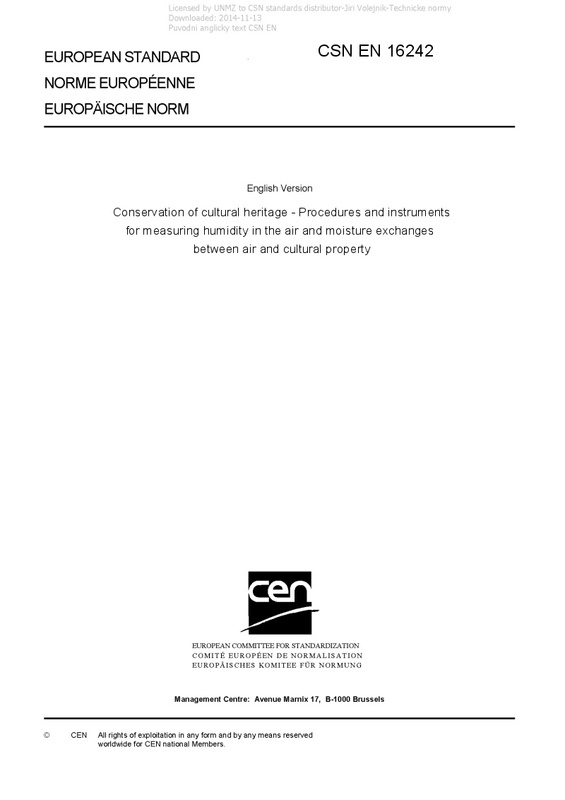 This standard contains recommendations for accurate measurements of ambient conditions and moisture exchanges between air and cultural heritage objects. It is addressed to anyone in charge of environmental diagnosis, conservation or maintenance of buildings, collections or single objects.